An ice-cold mountain spring gushing from a hole in a scenic canyon is a special place. But wait, this spring turns off and on every 15 minutes in the late summer and fall like there are some trolls in the mountain turning a huge hidden valve. You have to see it to believe it! There are relatively few intermittent non-geothermal springs in the world and this one is purportedly the largest. Old Faithful takes the gold medal because it is a spectacular and predictable geothermal geyser, but the Periodic Spring certainly belongs on the medal platform. ​After a drive through beautiful and peaceful Star Valley and seeing the world’s largest Elkhorn Arch in Afton, you need to allocate time to hike to the Periodic Spring. Located five miles east from downtown Afton, the first mile is paved, and the next four miles are on an unpaved road up a narrow scenic canyon that contains Swift Creek. The hike is 1.5 miles total round trip out and back with only a 200-foot elevation gain on an easy road. The last section to the mouth of the spring is steeper and not as easy. North view of Periodic Spring, Afton, Star Valley, and the Salt River Range. Faults are shown in red with triangles on the upthrown side of the Absaroka Thrust Fault (ATF), and barbells on the downthrown side of the Star Valley and Grand Valley normal faults. What explains the amazing intermittent spring? A siphon model was proposed by Rubey (1972) where a cave in the Madison Formation is connected to the spring orifice via a siphon as depicted in the figure below. During low flow (fall, winter & spring), the cave fills with water to the level of the overflow in the siphon, the water flows through the siphon driving out the air and begins the discharge. This starts a siphon effect, sucking water out of the cavern. The water flow stops when the water level in the reservoir drops below the level of the siphon intake allowing air in the cave to enter the siphon and breaking the siphon. The water remaining in the siphon then drains downward through cracks and talus. Siphon model that explains the cyclic on-off at Periodic Spring. A physical model was built by Shreve and Rubey. After Peter Huntoon and James Coogan, 1987, The Strange Hydrodynamics of Periodic Spring, Salt River Range, Wyoming, in WGA 38th Annual Field Conference Guidebook, figure 6 on page 342. The orifice of the spring is no longer natural. In the late 1950’s, the town of Afton tapped the spring for a water supply that did not need filtration or treatment. At the spring orifice, there was a small cave that sloped south into the mountain. During low flow cycles, the cave filled with water to the spill point and flowed down the creek. Then after shut-off, it emptied to a depth of about nine feet. The cave is now filled with blocks of talus and is capped by a cement intake structure where water is collected and piped to Afton. Flow rates of the spring vary dramatically during the year and also vary from one year to the next (see flow rate figure below). From June to August, the spring is at its peak and flows continuously with a rate of about 65 million gallons per day. During high flow, Afton collects and diverts down the pipe about 14 million gallons per day. From Late August through November, the spring flows about 15 minutes and shutoffs for about 15 minutes. This is the best time of year to experience the periodic spring. Discharge during this time is about 13 million gallons per day with the city collecting about 7 million gallons per day. Thus, when you view the spring come back to life, you are seeing about half of the total volume of the spring running down the creek. Lowest flow is December through May, when it flows about 4 minutes on and 26 minutes off. Daily discharge during this period is 1.8 million gallons per day with the city capturing the entire 1.8 million gallons per day. We assume this means no water can be seen flowing from the spring down the creek, but we have not been to the spring in the winter. Check for road closure dates in the winter and spring. Water levels at Periodic Spring orifice at successively smaller discharge rates. Note change from continuous flow to periodic flow. After Peter Huntoon and James Coogan, 1987, The Strange Hydrodynamics of Periodic Spring, Salt River Range, Wyoming, in WGA 38th Annual Field Conference Guidebook, figure 4 on page 340. 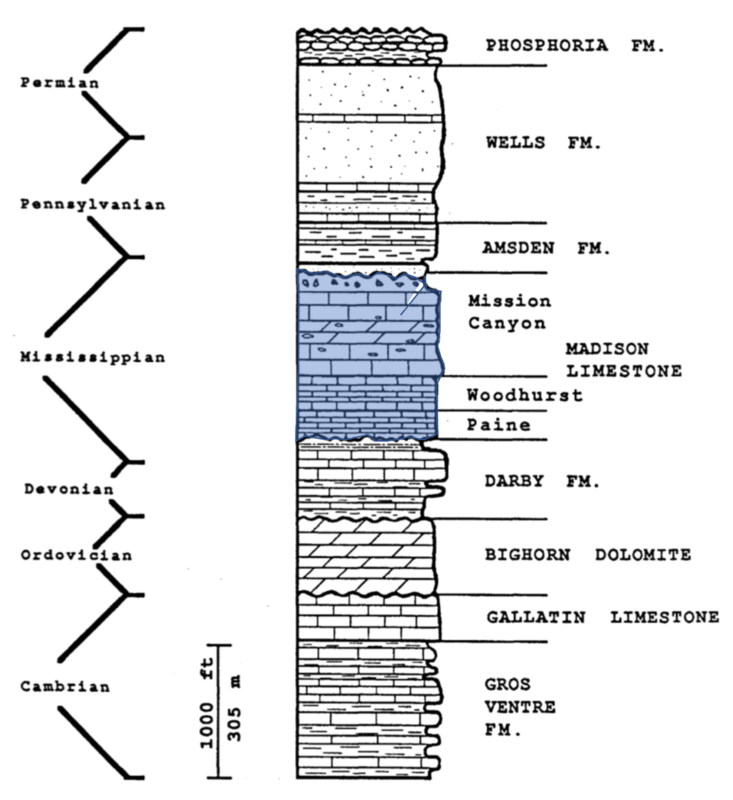 ​The Periodic Spring discharges from the upper-most part of the Mississippian Madison Formation, a regional aquifer composed of limestones and dolomites (see stratigraphic column below). The Madison in Wyoming is known for dissolution breccias, caves and large solution enhanced fractures. These karst features are a result of mildly acidic waters moving through the rock and dissolving the limestone. Stratigraphic column of Paleozoic rocks in the Salt River Range, Wyoming. The Periodic Spring discharges from the Madison Formation (blue). ​At the spring, the Madison is almost vertical and dips a few degrees on the east flank of a geologic fold called the Periodic Anticline. This fold is a result of movement along the low-angle Absaroka Thrust Fault that underlies the area and reaches the surface about five miles east of the spring. 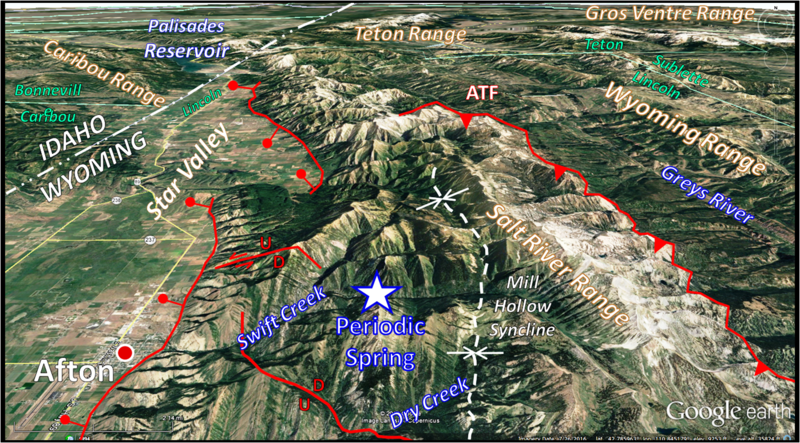 Recharge occurs where the Madison is exposed along the Periodic Anticline near the spring and from Madison outcrops about four miles east of the spring on the west side of Divide Anticline (see map and cross section below). The Madison outcrops on the west flank of the Divide Anticline appear to be continuous in the subsurface under the Mill Hollow Syncline to the Periodic Spring. The Divide Anticline is probably the major source of water to the spring because of its large area of Madison outcrop, high elevation difference between the outcrops and the spring that provides hydraulic head, and significant snow-pack. The water discharging from the Periodic Spring is coldest (~38 degrees F) in June and July during peak flow. Peak flow and coldest temperature also corresponds to the lowest amount of total dissolved solids in the water (~80 ppm). Water temperature during the Fall and Spring is slightly warmer (~ 43 degrees F) and the total dissolved solids are slightly higher (~120 ppm). The peak flow of colder and fresher water in June and July indicates that the snowmelt moves rapidly through the Madison, perhaps in a few weeks. Geologic map showing Periodic Spring (red star), creeks (thin black lines), town of Afton (yellow square), Madison outcrops (blue stipple) that act as recharge areas, probable subsurface water flow direction (blue arrows), location of geologic cross section (red line), faults (black lines with D for downthrown and U for upthrown side of faults), and major folds (black lines labeled as anticlines and synclines). After Peter Huntoon and James Coogan, 1987, The Strange Hydrodynamics of Periodic Spring, Salt River Range, Wyoming, in WGA 38th Annual Field Conference Guidebook, figure 2 on page 339. West to east geologic cross section from town of Afton to Periodic Spring to Madison recharge area about four miles east of the Periodic Spring. Madison aquifer is colored blue with probable subsurface water flow direction shown with blue arrows. Faults are shown in red. After Blanchard et al, 1990, WWRC-90-31, figure 4 on page 8. ​The geology of Lincoln and Uinta Counties is dominated by a series of long, north-south trending low-angle faults. These low-angle breaks in the crust called thrust faults are a result of compressional forces during a mountain building event, the Sevier Orogeny. The orogeny was caused by subduction of the Farallon oceanic plate beneath the western edge of the North American continent. It created a continuous mountain range from northwest Canada to New Mexico from 160 to 60 million years ago during the Late Jurassic and Cretaceous Periods. Immediately eastward of this mountain range, a seaway developed that extended from the polar region in the north to the Gulf of Mexico in the south. Horizontal movement on the thrust faults in southwest Wyoming moved sedimentary rocks eastward up to 50 miles in sheets that were 10,000 to 20,000 feet thick. Movement folded and faulted the sedimentary rocks into complex structures with a north-south orientation, perpendicular to the movement direction on the thrust faults (see geologic map below). This north-south orientation of the beds is easily seen along the drive and hike up Swift Creek to the Periodic Springs. Some of these structures in Uinta County near Kemmerer and Evanston hold impressive sized oil and gas fields. A much later regional relaxation of the stresses caused extension. This created a different set of north-south faults where Star Valley was dropped down and partially filled with younger sediments. Movement on these normal faults near Afton has continued into the last 10,000 years. Geologic map of Afton Quadrangle by Rubey 1973. Blues and purples are Permian Phosphoria (Ppp), Pennsylvanian Wells (PPw), Pennsylvanian Amsden (PMa), and Mississippian Madison (Mm). Greens are Jurassic Twin Creek (Jt), Jurassic Nugget (JTrn), Triassic Ankareh (Tra), Triassic Thaynes Limestone (Trty), and Triassic Dinwoody (Trd). Yellows are Quaternary gravels, wash and fans (Q).